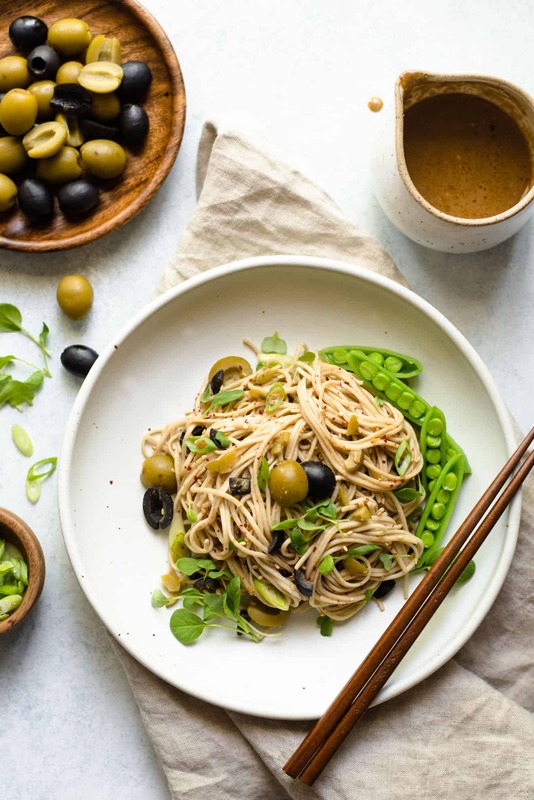 This irresistible vegan sesame and olive soba noodles dish is a quick meal that takes less than 30 minutes to make. The noodles are served cold with a delicious sauce made of ground sesame seeds and olive brine. This post was sponsored by California Olive Committee. Although I was compensated to write this post, all opinions are my own. Every so often when I’m over at my friend Elise’s house to cook, she’ll open up a can of ripe olives and offer them to me as a snack. The first time this happened, I was skeptical. “Who snacks on olives?” I thought to myself. But before I knew it, I cleaned out half of Elise’s olives. I even stopped by the grocery store on the way home to pick up a few cans for my afternoon munchies. When it comes to olives (or cooking in general), I should always trust Elise’s instincts! 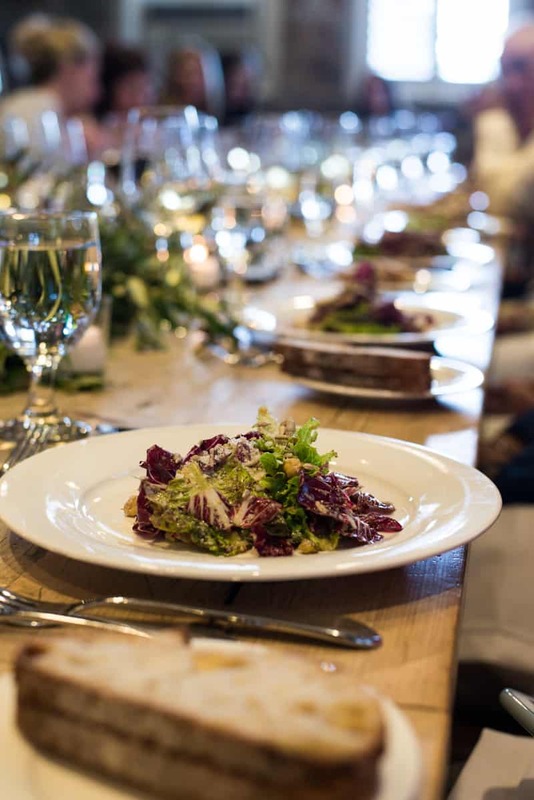 Early last month, I had the pleasure of joining Elise, the California Olive Committee, several olive growers and processors, the Culinary Institute of America (CIA) and a handful of amazing bloggers at St. Helena to learn more about the California Ripe Olive industry. The Mediterranean climate in California is ideal for growing olives, and the state produces 95% of the olives in the United States. 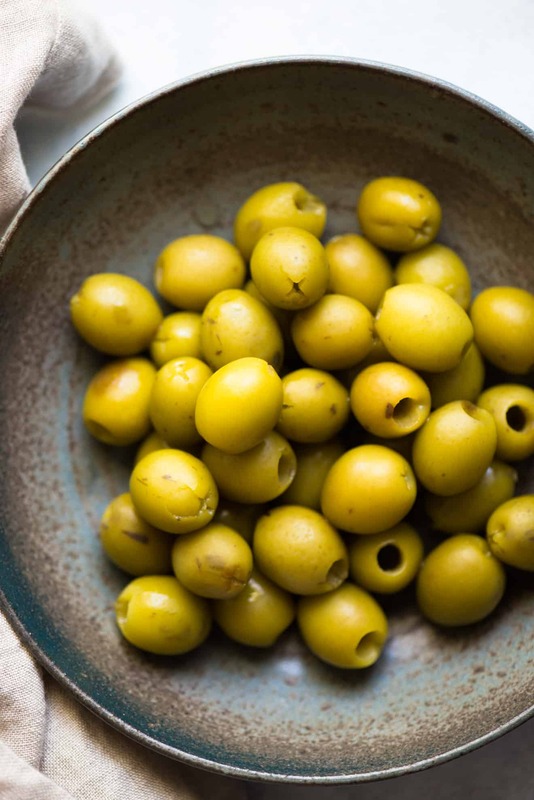 California ripe olives primarily come from two varieties of trees: Manzanillo and Sevillano. If you shop for ripe olives at the grocery store, you may have noticed that there are green or black ripe olives. Their difference in color has nothing to do with the type of tree where the olives come from. Rather, it’s the way in which the olives are processed that affects their color. First, the olives go through a curing solution to get rid of the bitterness of raw olives. Then, the olives are rinsed with water. To make the olives black, the olives go into a tank that gets pumped with oxygen. The exposure to air causes the olives to turn black. Green olives, on the other hand, do not go through the oxidation process. This process of curing olives for shipment was invented in the 1800s by Freda Ehmann, and olive producers still use her method to this day! Besides learning more about growing and processing olives, I ate a lot during my St. Helena excursion. 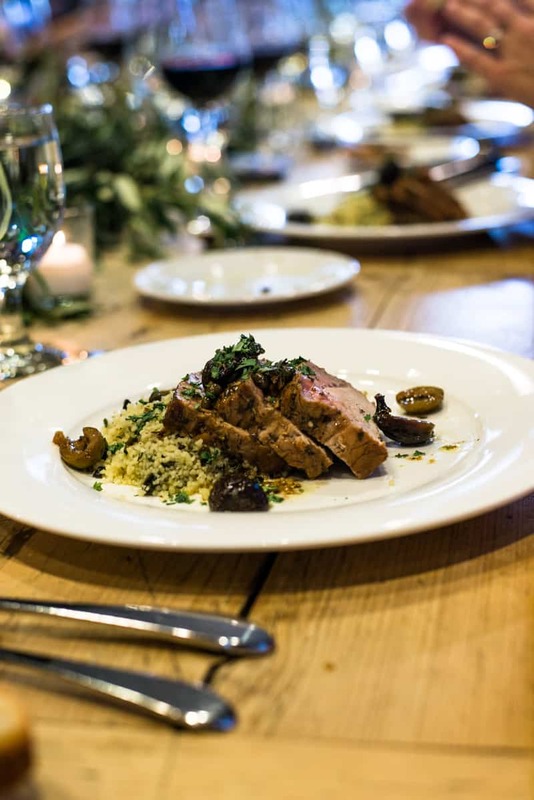 At CIA Greystone, we enjoyed a special olive-centric dinner that was designed by Elise and Emma of Simply Recipes and prepared by CIA chefs. The meal included a delicious radicchio salad with green olives, pork tenderloin with figs and olives and a corn and olive muffin dessert. I cleaned off all of my plates! Chef Paul Irving of the CIA also taught us all a few innovative ways to prepare ripe olives, like candied olives and smoked olives! The smoked olives were really something else. I loved how Chef Irving served them with pasta, letting the smoked olives be the star of the entire dish. Of course, we got to get our hands dirty in the kitchen, too! I was in a team with a few amazing women: Cariann from Oh Sweet Basil, Julia from The Roasted Root and Sarah from Snixy Kitchen. 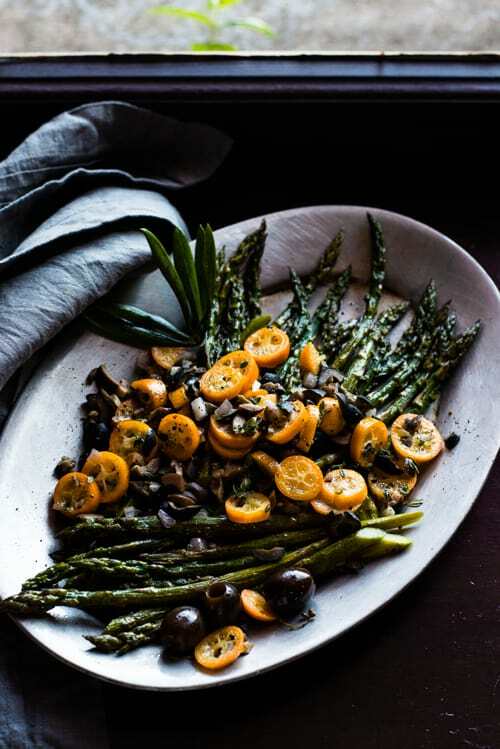 We cooked up a roasted asparagus dish with an olive and kumquat tapenade as well as a brown butter and garlic pasta with olives and roasted carrots. To be honest, it was a little intimidating to be cooking in the CIA kitchen, surrounded by chefs who are far more talented than I. But the ladies on my team made me feel relaxed the entire time. This sesame and olive soba noodle dish is inspired by my trip. I wanted to demonstrate the versatility of cooking with ripe olives by pairing them with Asian flavors. I’m flavoring the noodles with a sauce mainly composed of ground sesame seeds, the olive brine that comes from a can of green olives and soy sauce. I also added chopped olives to give the noodles more olive flavor. 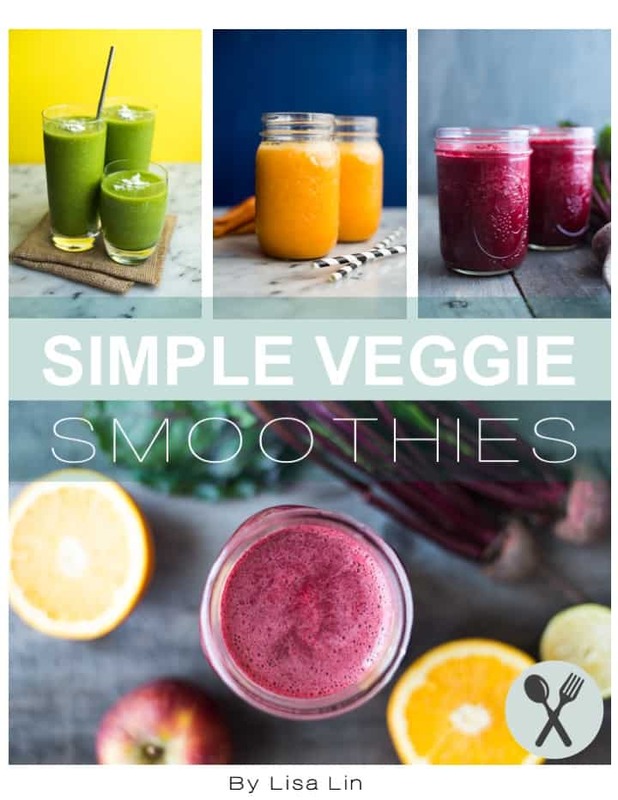 This meal is ready in less than 30 minutes, and it’s great with a side of vegetables. Grinding the sesame seeds: I keep an extra coffee grinder in the house for grinding spices, and that’s what I used to grind the sesame seeds. My food processor and blender are way too big for grinding just 3 tablespoons of sesame seeds. It’s tough for the blades in these machines to pulverize such a small amount of food. I highly recommend keeping a spare coffee grinder in the house to use as a spice grinder. Gluten-free soba noodles: A lot of soba noodles that you see in the supermarket are not gluten-free, so read the ingredients on the packaging carefully. The noodles that you see in these photos are not gluten free. 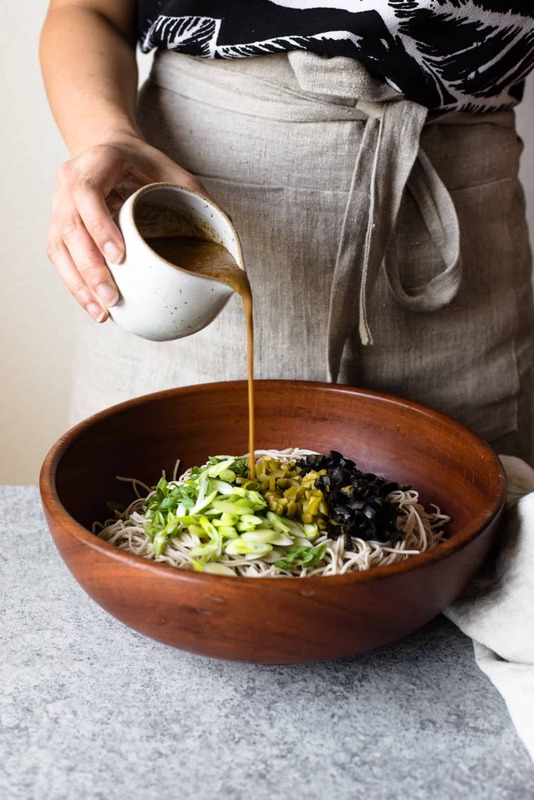 Soba noodles made with 100% buckwheat are much darker. These soba noodles are great on their own or served with a side of stir-fried vegetables and your favorite protein, such as tofu, chicken or shrimp! Add about 2 quarts of water to a pot. Bring the water to boil. Add the noodles and cook them for 4 to 5 minutes, until they’re soft. Drain the noodles and rinse them under cold water. 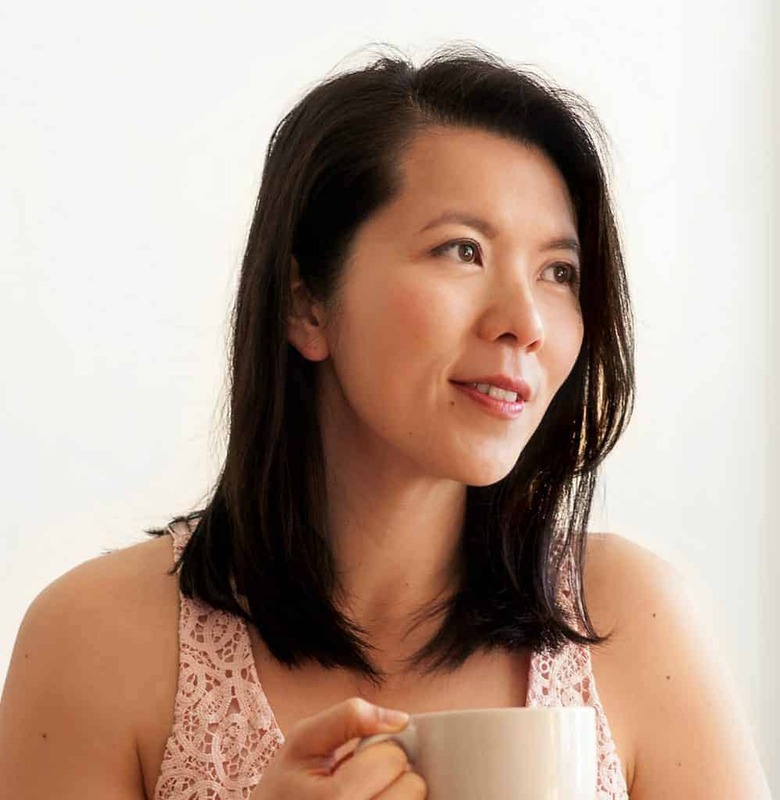 Using a coffee or spice grinder, grind the sesame seeds for about 5 seconds. Most of the sesame seeds should be ground into a powder. It’s fine if you find several whole sesame seeds in there. Add the olive brine, soy sauce, rice vinegar, brown sugar and garlic to a small saucepan and heat it over medium heat. Once the liquids start boiling, about 2 minutes, turn off the heat and stir in the sesame oil. 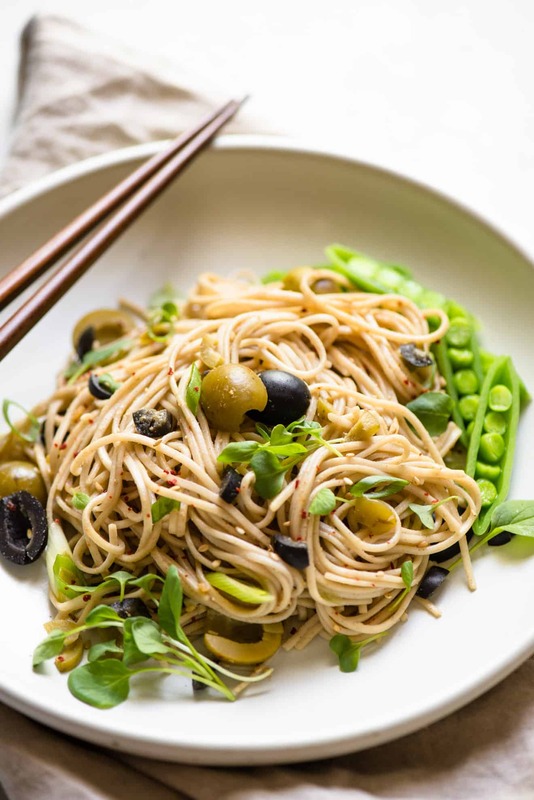 Toss the soba noodles with the chopped olives, scallions and about half of the sauce. Taste the noodles and drizzle more sauce to taste. Top noodles with sesame seeds and red pepper flakes if you like. If you have raw sesame seeds, toast them on the pan for several minutes, until they turn golden brown. Once the pan starts heating up, stir the seeds frequently to keep them from burning. For aesthetic reasons, I’m using a mixture of sliced and halved green and black ripe olives for the soba noodles. You can serve the dish with just green olives alone. If you want to make a gluten-free version of this dish, use 100% buckwheat soba noodles and tamari. Cook the noodles for about 6 or 7 minutes. In one of my test batches, I used honey instead of brown sugar for the sauce and it tasted great, too. Feel free to swap the brown sugar with your favorite sweetener. Thanks to the California Olive Committee for sponsoring this post! 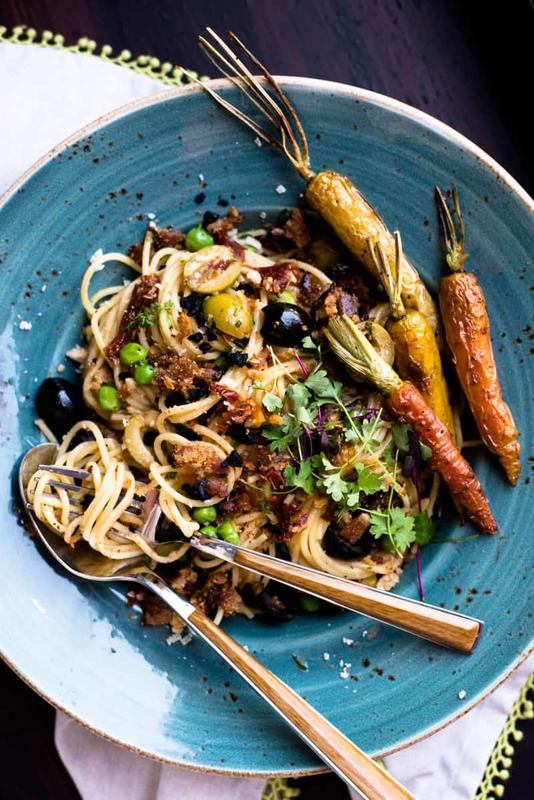 To learn more about California Ripe Olives and to get more recipe inspiration, visit their website or follow them on Facebook, Pinterest and Twitter. 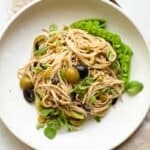 What a great way to incorporate olives into pasta! I love soba noodles and sesame and this would be a great combo. I’m so glad you could join us in Napa! Thank YOU, Elise for the dinner and cooking sessions! 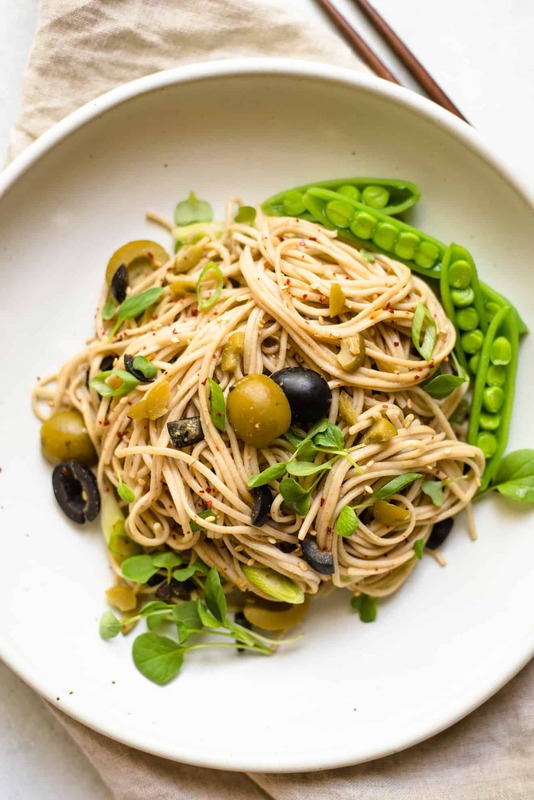 I am so in LOVE with the nutty taste of soba noodles right not, and can only imagine how good it would be with olives! Gorgeous photos too! Great idea to add olives in an Asian dish. Love how simple and easy this is to prepare, but seems packed with flavor.